I do the whole party, all you do is the food! Firstly, I would suggest you book a hall. Most parents find from my experience that it is better to have somewhere that is not their own house (so avoiding damage and mess to your own home) is less stressful for them and of course the average church hall will automatically give you so much more room to hold the event. This does also mean that I have more room (in some modern houses, I cannot do your party, there is just not the room and ceiling height is problem for the P&J booth) to perform and I find children enjoy themselves more in a venue with room to move about and enjoy themselves. It is worth the extra cost, which is not that much in most cases, approx, £ 5 per hour, so it will not add too much to the cost of your party and take it from me, you will be glad you did, as when the party is finished, you can go home to a nice tidy home. 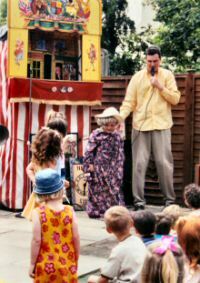 When it comes to birthday parties, Punch and Judy goes down very well with children of all ages (it is also the bit of the party the adults like th most!). As part of a whole party, it fits in well, so in addition to P&J, I perform magic. 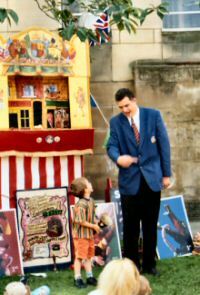 This involves the children, with, various assistants helping me perform the tricks and of course the birthday child will always be invited to help. I also provide all the music for dancing and organise games and other party activities. All you have to do is provide the food. All times are approximate, this is just a typical plan (always have a plan), but at the end of the day, a party is for children to enjoy themselves, so you should always go with the flow. If children are happy and have a great time, they will remember your party over and above others they may go to. Too often these days children go to McDonalds or soft-play centres, which are OK, but have been done and done..........! If you would prefer a slightly longer party of 2.5 hours, this is fine and the party will follow a similar flow with each segment of the party is slightly longer, so in essence, the same and just as entertaining. I would suggest that anything over 2.5 hours is simply too long for most children. If you would like to book me for your party, please contact me and we can discuss your requirements and have course the fee. I have an immense amount of experience of children’s parties (I have done enough over the years), so let me use this to help you have a stress-free party of you and great time for your child and their guests.